Well folks, it has been a long time. I’m still kicking, just not writing very much. Recently, I picked up a new exhaust system for the motorcycle. Now, I’ve been trying to live on the cheap lately so that I can pay off some bills and get some more life into my savings account. However, I found a great deal on these pipes and picked them up for less than half of their retail price. I put them on the motorcycle a couple of weeks ago, but hadn’t gotten a chance to rejet the carburetors until this past Friday, which I had off from work. I got the carbs back on the bike on Saturday, but didn’t have a chance to give the bike a shakedown cruise until today. I headed north out of Statesboro. 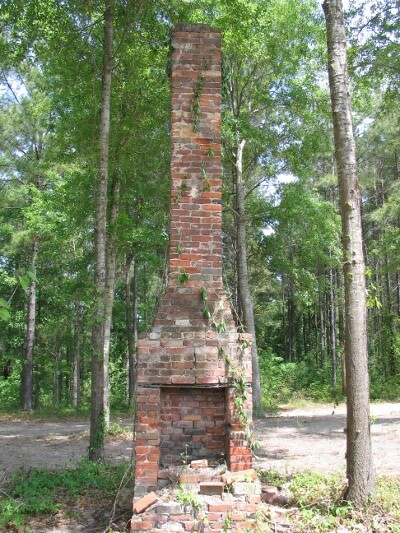 A little ways out of town I passed a chimney in the middle of some trees. It must have been part of a house at some point, but as you can see, these trees are pretty tall around it. 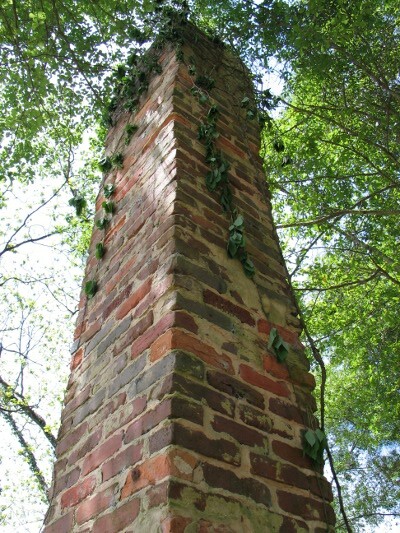 Whatever structure it was a part of has been gone for decades. 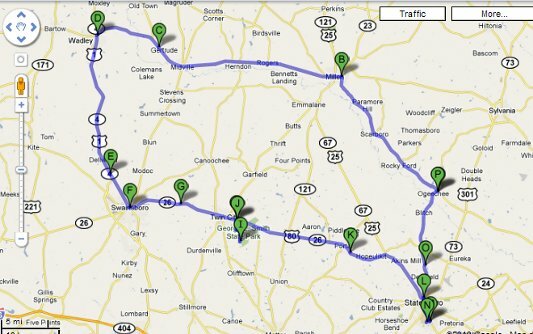 Anyway, as you can see from the route above, I went north until I hit GA-17, followed that until US-1/GA-4, took the US-1 Business route into Swainsboro, then popped onto US-80 to head back to Statesboro. On my way, I passed a sign for George L. Smith State Park. I decided to check it out. There’s a pond in the park. 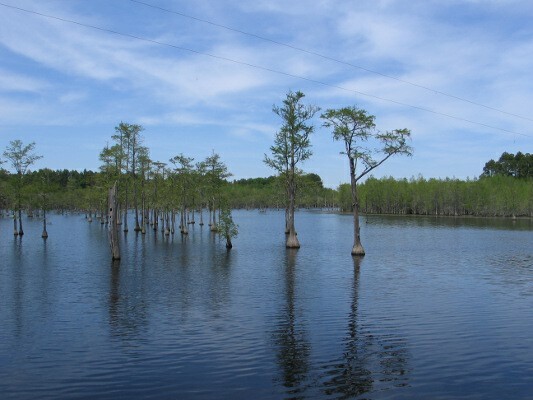 Trees are growing out of the pond. 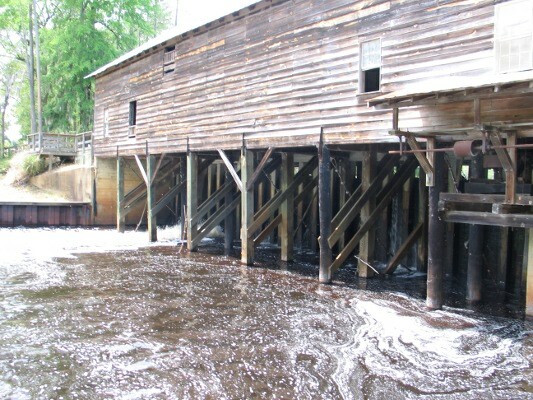 There’s a restored grist/saw/cotton combination mill at the park. Here it is from the outside. It was built sometime around 1880. 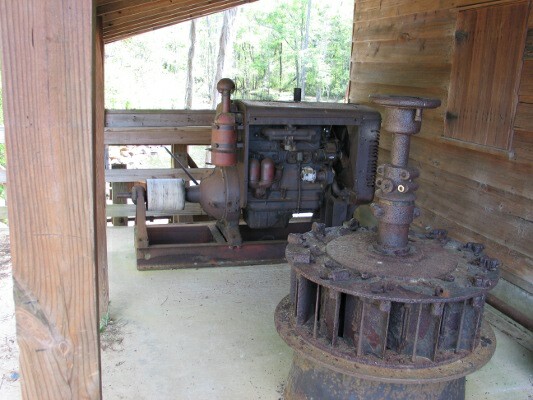 Here is the original mill turbine (quite rusted) and the ‘original’ diesel generator (which was installed to supplement the water power in the 1950s). After checking out the mill, I hiked around a trail for about 2.7 miles, and then headed back towards the mill. I took a seat in a little gazebo, read a chapter in the book I had with me, and then headed back to the bike. Here’s the saddest part of the trip. When I got back to my bike, there were two other Shadows parked next to it! 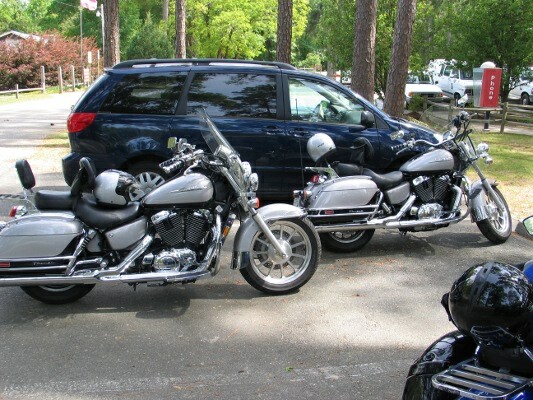 They’re matching Honda Shadow 1100 ACE Tourers. The Ace T is very similar to my bike, but set up from the factory as a touring bike. According to the stem stickers, these pretty bikes were built in May of 1998. A check of their odometers, though, revealed troubling news. They only had just over 15,000 miles on the clock. Here are two beautiful touring bikes, with lots of aftermarket accessories, even: driver floorboards, highway floor boards, GPS, a bike to bike intercom system… all the accessories were matching, of course. But in their 12 years of life, only 15,000 miles on them. I don’t understand a couple that will drop the money on two great touring bikes, outfit them with hundreds of dollars of aftermarket parts, and then ride them less than 1300 miles a year. Bikes had GA plates too, a further tragedy, as these people live in a place with 10 month – year round riding weather. As for my bike, it performed beautifully. The new jetting feels great on the bike, the pipes sound good, and I still hit just a tad under 45 miles per gallon. This entry was posted on Sunday, April 18th, 2010 at 21:58	and is filed under motorcycle. You can follow any responses to this entry through the RSS 2.0 feed. You can skip to the end and leave a response. Pinging is currently not allowed. There are numerous varieties of range of credit rating. Everyone truly has lots of fico scores for the range of credit rating style simply because every one of three countrywide credit reporting agencies, Equifax, Experian and also TransUnion, possesses his own databases. Range of credit scores have got different brands at intervals of in the different credit reporting organizations: Range of credit ratings are widely-used by simply 90% of the lenders. Typically I can’t read through post upon websites, even so would want to state that this specific write-up pretty required us to think about along with apply it! A person’s crafting tastes has been astonished everyone. Thanks, very good article. That’s a powerful read through. Everyone loves this blog.